We’d love your help. Let us know what’s wrong with this preview of Chocolate a la Murder by Kirsten Weiss. Maddie gets rattled by a candy-coated murder. It's Wine and Chocolate Days in San Benedetto, and paranormal museum owner Maddie Kosloski has sweet dreams about her new Magic of Chocolate exhibit. Her latest attraction is a haunted Mexican whisk called a molinillo that rattles if someone lies. When Maddie visits the town's new boutique chocolate shop, she finds one of the owners dead and covered in melted cocoa. Maddie's determined to catch the killer, and she soon uncovers deadly dealings in the world of artisan chocolate. But the deception surrounding those dealings are enough to make the molinillo rattle all night. Will Maddie have to temper her passion for sleuthing before a killer makes her fate bittersweet? To ask other readers questions about Chocolate a la Murder, please sign up. 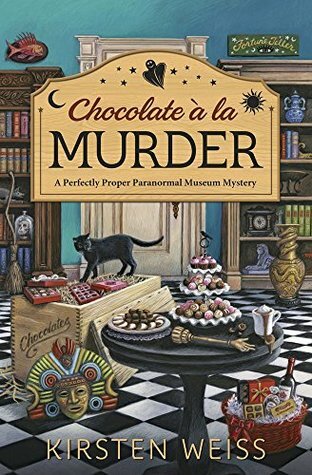 Chocolate a la Murder by Kirsten Weiss is the fourth book in the cozy A Perfectly Proper Paranormal Museum Mystery series. Each book in the series features a new murder case to be solved so they could be read as a standalone if one chooses although some character/setting building would be missing if not starting at the beginning. In this installment of the series we pick back up with Maddie Kosloski who owns the Perfectly Proper Paranormal Museum in San Benedetto. The museum is a local town touri Chocolate a la Murder by Kirsten Weiss is the fourth book in the cozy A Perfectly Proper Paranormal Museum Mystery series. Each book in the series features a new murder case to be solved so they could be read as a standalone if one chooses although some character/setting building would be missing if not starting at the beginning. In this installment of the series we pick back up with Maddie Kosloski who owns the Perfectly Proper Paranormal Museum in San Benedetto. The museum is a local town tourist attraction that exhibits artifacts that have a paranormal or haunted history attached to them. Maddie’s latest artifact is a haunted Mexican whisk called a molinillo that rattles if someone lies. As Maddie jumps in and gets involved in Wine and Chocolate Days in San Benedetto she finds that she is missing the key chocolate to make her Magic of Chocolate exhibit a success. Maddie decides to just head over to the chocolate shop and pick up the delivery herself but when she walks into a quiet business only to discover the owner in the back covered in chocolate and an apparent murder victim so Maddie again finds herself hunting down a murderer in her small little town. I have been following the Perfectly Proper Paranormal Museum series since the beginning and really enjoy picking up each new installment. This would be one that definitely has that quirkiness to it that I enjoy and a great cast of character returning from book to book, along with GD the ghost detecting kitty cat. It’s not overly heavy on the paranormal but that little touch just gives it a bit of something extra fun. Already looking forward to the next visit with Maddie and friends. I enjoyed reading this fun cozy murder mystery set in San Benedetto, California. Maddie Kosloski is the protagonist and is the owner of the Paranormal Museum. She has some interesting items in her museum and there is kind of a side mystery about one of the items, a molinillo (a Mexican chocolate stirrer), that is haunted and rattles when someone lies. Maddie discovers a body at a local chocolate maker's shop and she pursues the investigation of the homicide like a bulldog to try to solve the cas I enjoyed reading this fun cozy murder mystery set in San Benedetto, California. Maddie Kosloski is the protagonist and is the owner of the Paranormal Museum. She has some interesting items in her museum and there is kind of a side mystery about one of the items, a molinillo (a Mexican chocolate stirrer), that is haunted and rattles when someone lies. Maddie discovers a body at a local chocolate maker's shop and she pursues the investigation of the homicide like a bulldog to try to solve the case. Some quirky characters in this light read but nothing too deep. There's a fun cat named GD who likes to attack on the police officers. Maddie Kosloski is the owner of a paranormal museum in San Bendetto. She is busy preparing for her Magic of Chocolate exhibit at the museum when she accidently finds the body of one of the owners of the chocolate store Reign dead, smothered in chocolate. In the meantime her latest haunted museum piece is keeping her very "rattled". As Maddie searches for clues as to who would want to kill the chocolatier, the suspects keep adding up. As for her newest paranormal find, she needs to investigate it Maddie Kosloski is the owner of a paranormal museum in San Bendetto. She is busy preparing for her Magic of Chocolate exhibit at the museum when she accidently finds the body of one of the owners of the chocolate store Reign dead, smothered in chocolate. As Maddie searches for clues as to who would want to kill the chocolatier, the suspects keep adding up. As for her newest paranormal find, she needs to investigate its history to figure out why (and if) it is haunted. She has assistance from her friends Adele and Harper as well as her boyfriend Detective Jason Slate. She perhaps gets her "extra sensory" help from her cat GD who keeps her on her toes. This book 4 of the series and although there were references to the previous books (naturally) which went over my head, it was not a problem in understanding the story. Chocolate a la Murder is a funny, cozy read on a snowy day (which I did) with a nice cup of hot chocolate! The book has just come out. Thank you #NetGalley #Midnight Ink #Chocolate a la Murder #Kristen Weiss for the advanced copy. This is my first read by Kristen Weiss and I was interested in trying out this series because of its paranormal aspect. I’ve read quite a few Cozy Mysteries but the majority of them have been Contemporaries. So when I saw that this one had a paranormal twist to it, I was excited to read more. First off, I really like the concept of this series. It has a paranormal museum as the main location and in addition to the spooky atmosphere, there’s a lot of detail and history with it as well. I thought that this added a lot of intrigue to the series, making it far more unique than other books in its league. Another thing that I really enjoyed about this book were the characters. I really grew to love Maddie and her friends. Their friendship was so fun to read about and also, I love how the several personalities worked together to create a more well-rounded unit. It just made the book more fun because you have a strong connection to the heroine. That being said, I’m very excited to read the other books in the series. I liked this addition to the series but not as well as the others. This one seemed a little drawn out further than needed and had many different paths that could've been taken to make the story a bit better in my opinion but weren't. In this one Maddie displays a "haunted" molinillo that supposedly rattles when a lie is told. It is also Wine and Chocolate Days in the town. Things take a deadly turn when Maddie finds a dead body at the local chocolate shop. Of course she can't help but stick her n I liked this addition to the series but not as well as the others. This one seemed a little drawn out further than needed and had many different paths that could've been taken to make the story a bit better in my opinion but weren't. In this one Maddie displays a "haunted" molinillo that supposedly rattles when a lie is told. It is also Wine and Chocolate Days in the town. Things take a deadly turn when Maddie finds a dead body at the local chocolate shop. Of course she can't help but stick her nose in and ask a few questions which gets her in trouble and leads to more danger. This book was OK. I still really like Maddie, and her friends, and the mystery was enjoyable. However, I am SO over Mason and Belle being injected into every book. I hated that storyline from the beginning because it was too "romance" angsty, and honestly...Mason was/is a douche IMO. Although I am glad Maddie has a new love interest, Jason is about as exciting as milk toast and kind of an a$$hole. And don't get me started on Laurel. She is a complete caricature at this point and there is NO way someone that treats another human being as she does Maddie would ever be a detective on a police force. Her a$$ should have been canned AGES ago, and Jason defending her...NO. So obviously this was a mixed bag for me. I may give the next book a try, but I still undecided as of now. Thanks to NetGalley and Midnight Ink for providing me an advanced digital read copy of Chocolate a la Murder by Kirsten Weiss in exchange for an honest review. This is the fourth book in A Perfectly Proper Paranormal Museum Mystery series and my first read in the series. While there are some relationships between Maddie Kosloski, museum owner and central protagonist, the mystery is self-contained and there is no requirement to have read the earlier books to follow the action in this novel. In t Thanks to NetGalley and Midnight Ink for providing me an advanced digital read copy of Chocolate a la Murder by Kirsten Weiss in exchange for an honest review. This is the fourth book in A Perfectly Proper Paranormal Museum Mystery series and my first read in the series. While there are some relationships between Maddie Kosloski, museum owner and central protagonist, the mystery is self-contained and there is no requirement to have read the earlier books to follow the action in this novel. In this book, Maddie has obtained a haunted Mexican molinillo that rattles whenever a lie is told. There are some references to this effect, however this doesn’t play a role in Maddie’s unmasking the murderer in this case. There were some opportunities when the phenomenon could have been incorporated into the action, however that wasn’t done. Instead, there was a brief reference to some action that was possibly caused by the ghost of the former owner of the molinillo which is resolved when Maddie intuits the correct answer to who killed this woman. However, that was not a central part of the mystery, and played no part in solving the main murder. The primary focus is Maddie being drawn into who killed the chocolate co-owner in his chocolate shop. She meets resistance from her mother and her boyfriend, who is a police officer, as they both want her to stop her investigations. Although she implies she is walking away from the investigation when talking with them, she is constantly drawn back into it, voicing her rationalizations for what she is doing until she finally decides she needs to be honest with them and with herself about her decision to continue investigating. Secondary stories include a former boyfriend who keeps dropping by the museum, a contentious relationship between Maddie and her boyfriend’s police partner, and her best friend’s upcoming wedding. While these side stories are woven throughout the story, they didn’t add much interest or depth to the story itself. There are some clues given throughout, as well as some misdirection, however the primary information for the armchair detective may actually be the personalities of those involved. I found Maddie somewhat irritating, in that she came across as fairly shallow with no solid reason for feeling compelled to solve the murder. The secondary characters also seemed to have little depth to them, so it was difficult to ever feel part of the action or the community. That may be a result of not having read the earlier books in the series. If you are looking for a book with a strong paranormal element, this is probably not going to provide what you want. If, however, you are looking for a light read with some opportunity to solve the mystery on your own, this might be a book you will enjoy. It is easy to pick up and put down, so may be the perfect read for a plane ride, a beach trip or something similar. If you’re a fan of Laura Childs Scrapbooking Mystery series, I think that you might end up liking this one too. There’s a balance of plot and fun antics as well, which I think is hard to come by and why this series makes me very excited for more. The setting for the story is a town called San Benedetto in the California wine country. In “Chocolate a la Murder,” owner, Maddie Kosloski, of the Perfectly Proper Paranormal Museum, is preparing for The Wine and Chocolate Days Festival in San Benedetto. Maddie has sweet dreams about her new Magic of Chocolate exhibit. Her latest attraction is a haunted Mexican whisk called a molinillo that rattles if someone lies. When Maddie visits the town's new boutique chocolate shop, she finds one of the owners dead and covered in melted cocoa. Maddie's determined to catch the killer, and she soon uncovers deadly dealings in the world of artisan chocolate. But the deception surrounding those dealings are enough to make the molinillo rattle all night. Will Maddie have to temper her passion for sleuthing before a killer makes her their next target? Although I haven’t any read of the first three books of the series, Kirsten Weiss, provides plenty of back-stories, so “Chocolate a la Murder” works well as a stand-alone novel. Written in the first person, the characters in this novel were a real laugh and I especially liked Maddie’s feistiness. I even found myself asking the same questions and thinking along the same lines as Maddie when trying to work out the identity of the perpetrator. I really enjoyed the easy-to-read writing style, the plot and the pace of the book. The paranormal element helped to add intrigue to the tale, whilst making it a little different to some of the other books in the genre. All in all, “Chocolate a la Murder” is a light-hearted, lovely read, that combines mystery, thrills and murder and mayhem and I'm looking forward to reading the first three books of the series. Maddie has a new magic chocolate exhibit just in time for the Wine and Chocolate Days being held in her hometown of San Benedetto. She was able to purchase a whisk that is said to be haunted and has the ability to tell when someone is lying. The whisk rattles when someone lies, Maddie doesn't know everything about it though and hopes to do more research so that she can share with her patrons. When her chocolate order doesn't arrive when it is suppose to and she can't get through with a phone cal Maddie has a new magic chocolate exhibit just in time for the Wine and Chocolate Days being held in her hometown of San Benedetto. She was able to purchase a whisk that is said to be haunted and has the ability to tell when someone is lying. The whisk rattles when someone lies, Maddie doesn't know everything about it though and hopes to do more research so that she can share with her patrons. When her chocolate order doesn't arrive when it is suppose to and she can't get through with a phone call Maddie decides to drive to the chocolate shop to find out what is going on. She comes across a disgruntled former employee outside but doesn't let that stop her from going in. Things don't get any better when she goes inside, not being able to find anyone she heads to the back of the store and come across a body covered in chocolate. The dead man happens to be one of the owners of the store, but who would have wanted him dead and why? Could it have been an accident? Maddie decides she must look into things herself even though there are so many people against the idea of her doing just that. Along the way she is almost run over by a crazy driver and then later someone tries to drown her. Is she getting to close to the truth? Follow along and see just what all Maddie gets into and the different ways she beats death in this fun mystery series. If you like things that are a little wacky, a touch magical, and a bit haunted this is truly the series for you. I love the characters and the different things that Maddie brings to her museum, I can't wait to see what she brings in next. When I reviewed Kirsten Weiss' Deja Moo (http://bit.ly/2FB8kQe), I mentioned the interesting characters and setting. Maddie Kosloski, owner of the paranormal museum in San Benedetto, California is back in Weiss' Chocolate a la Murder, but, this time, her mother isn't quite as eager to participate in the investigation. Instead, she worries about Maddie and her involvement in the latest murder in town. Maddie's latest exhibit at the museum ties in with the town's Wine and Chocolate Days. However, t When I reviewed Kirsten Weiss' Deja Moo (http://bit.ly/2FB8kQe), I mentioned the interesting characters and setting. Maddie Kosloski, owner of the paranormal museum in San Benedetto, California is back in Weiss' Chocolate a la Murder, but, this time, her mother isn't quite as eager to participate in the investigation. Instead, she worries about Maddie and her involvement in the latest murder in town. Maddie's latest exhibit at the museum ties in with the town's Wine and Chocolate Days. However, the chocolates ordered from Reine Chocolates have't arrived, so Maddie offers to pick them up for her business and her friend's tea room. Yet, she can't find anyone at the chocolate factory, except for a lone picketer. As she hunts through the factory, she loses her taste for chocolate. Finding a man's body, covered in chocolate might cause that. The 911 operator asks her to do CPR, which only makes it a stickier mess when the police arrive. Maddie might be dating a police detective, but, after finding the body, she can't forget the scene. She asks so many questions that someone tries to run her over. She also believes she's being followed. Despite warnings from her worried mother, the police, and even signs from her cat, Maddie's convinced that since she found the body, she's supposed to be involved in solving the murder. I adored this book! It checked off all the boxes for a typical cozy mystery but I loved the spin that the author put on these standard tropes. Single female owning her own business (a paranormal museum), kooky friends/relatives, a love interest in the police force, a pet (in this case, a ghost sensing cat), a great small town. If you are a fan of cozy mysteries, then I highly suggest you pick up this book! Paranormal museum owner Maddie Kosloski is thrilled to participate in San Benedetto's Wine and Chocolate Days. Her latest addition to the museum is a haunted Mexican whisk called a molinillo that rattles if someone lies. When Maddie goes to Reign to pick up chocolate for her exhibit she finds one of the owners dead and covered in melted chocolate. Despite being warned off by the lead detective, and her detective boyfriend Jason, Maddie starts investigating. Unfortunately it could end up with her Paranormal museum owner Maddie Kosloski is thrilled to participate in San Benedetto's Wine and Chocolate Days. Her latest addition to the museum is a haunted Mexican whisk called a molinillo that rattles if someone lies. When Maddie goes to Reign to pick up chocolate for her exhibit she finds one of the owners dead and covered in melted chocolate. Despite being warned off by the lead detective, and her detective boyfriend Jason, Maddie starts investigating. Unfortunately it could end up with her being murdered, too. If you found a body covered in chocolate, would it kill you love of the sweet treat? I asked myself that question a lot while I was reading this book. Maddie had that problem, too, and it hit me that I would probably think the same thing. That question added to this series, which I love because of its quirkiness. The paranormal museum is what first drew me to this series, and I've kept going with it because of the well drawn characters and the interesting plots. I can honestly say I've never seen a haunted molinillo in a book, and I loved watching the way Maddie recovered information about its past, and how it fit into the story. Although I figured out whodunit about halfway through the book, I enjoyed the trip to the reveal very much. I love this series, and look forward to Maddie's next adventure. Maddie is back with her paranormal museum getting ready for the town's Wine and Chocolate Days. She has a brand new haunted Mexican chocolate whisk called a molinillo and if you tell a lie, it rattles! Along with her Magic of Chocolate exhibit and lot of chocolate from the new artisanal chocolate shop,she's hoping things go well. With Adele all a twitter over wedding plans, Maddie gives her one less thing to worry about by picking up their joint chocolate order. She finds the shop empty and one o Maddie is back with her paranormal museum getting ready for the town's Wine and Chocolate Days. She has a brand new haunted Mexican chocolate whisk called a molinillo and if you tell a lie, it rattles! Along with her Magic of Chocolate exhibit and lot of chocolate from the new artisanal chocolate shop,she's hoping things go well. With Adele all a twitter over wedding plans, Maddie gives her one less thing to worry about by picking up their joint chocolate order. She finds the shop empty and one of the owners dead,covered in chocolate! While hunky boyfriend Jason is off this case Maddie will have to hope Laurel won't lock her up just for being on the scene! And of course she is going to do what she does best. Investigate. It's just a hobby. Until someone tries drowning her, and not in chocolate! Everyone at the chocolate company was sketchy so there were plenty of people to be suspicious of but Maddie needs a motive to find the killer before more bodies are found. And by the way her molinillo is rattling lies are plentiful. I love the characters in this series. They are fun and quirky and just very relatable! And this one was extra good because of the chocolate and the fact I learned what a molinillo was! Smart, quirky, and just plain fun is what this series is! I received an ARC of this book from Netgalley and Midnight Ink. It is Wine and Chocolate Days in San Benedetto and Maddie has set up a Magic of Chocolate exhibit in her paranormal museum. She plans to entice visitors with haunted chocolate implements, gourmet chocolate for sale, and fortunes read in hot chocolate. Maddie is especially excited that the chocolate she will be selling is local and artisinal. Everything is ready to go except the bulk order of chocolate Maddie and her friend Adele went I received an ARC of this book from Netgalley and Midnight Ink. Everything is ready to go except the bulk order of chocolate Maddie and her friend Adele went in on together has not been delivered. To save Adele some stress, Maddie offers to visit Reign to see where their order is. Visiting Reign is where things take a turn for Maddie - she discovers the body of one of the owners. The pace and danger ratchet up until Maddie's survival is in question. This was a nice cozy but nothing groundbreaking. A good read for bad weather days. Chocolate Days are here and Paranormal Museum owner, Maddie, has a haunted molinillo on display that rattles whenever a lie is told. Someone is definitely lying about something when the new chocolate shop's owner is found dead by Maddie when she goes to check on an order. She finds herself in a sticky sweet mess trying to determine if it was his disgruntled ex-employee, his business partner or someone even closer to home. If a murder wasn't enough to keep her occupied, Maddie finds herself wonde Chocolate Days are here and Paranormal Museum owner, Maddie, has a haunted molinillo on display that rattles whenever a lie is told. Someone is definitely lying about something when the new chocolate shop's owner is found dead by Maddie when she goes to check on an order. She finds herself in a sticky sweet mess trying to determine if it was his disgruntled ex-employee, his business partner or someone even closer to home. If a murder wasn't enough to keep her occupied, Maddie finds herself wondering if her former biker boyfriend is trying to win her back. Not that she's interested since she has a new relationship with a handsome policeman. This is a great series and one of my new favorite indulgences. Weiss does a great job combining small bits of comedic relief with the paranormal underpinnings without stepping over the line. The mystery portion is believable and I love the interplay between Maddie and her two best friends. This series is so unique and each installment just adds more and more. I love how the author just adds upon the small town and all its quirks without anything seeming to get overplayed. This mystery was so different and the little bonus mystery just added to it. Every time I think this series cannot top itself, the author blows me away. Dear Lord! One would think Maddie Kosloski lives in a sprawling urban center filled to the brim with mischief and mayhem rather than the sleepy little town of San Benedetto. The woman can’t even go to the chocolate shop without tripping over a dead body! Much to the great displeasure of literally everyone in her life, Maddie has found yet another dead body and this time it is one of San Benedetto’s beloved chocolate makers. The death itself is bad enough, but it’s made even worse by the fact the town is knee-deep in one of its biggest annual events, Wine and Chocolate Days. Even Maddie’s paranormal museum has gotten in on the action with a Magic of Chocolate display featuring a haunted molinillo. Though she knows nothing about the murder and little more about the molinillo, Maddie intends to find out everything she can about both. As Maddie begins poking around into the death of the chocolate maker, she finds misdeeds, irregularities, and lies that simply cannot be explained. While the chocolate is delicious, nothing about the chocolate maker and his business make sense. What’s more, with each new discovery, Maddie finds herself drawn deeper into a killer’s net. Not only is her museum threatened, but so is her relationship with her cop boyfriend, and her life. Maddie doesn’t want to stop digging, but she’s up to her neck in a mess and the killer is clearly willing to go to great lengths to protect his/her identity. As if all this weren’t enough, Maddie also has her investigation into the history of the haunted molinillo, helping her bat-crap crazy friend Adele plan her ridiculous wedding, and her ex-boyfriend is stopping by the museum a lot and acting weird. Needless to say, all the drama has Maddie on edge which is causing a great deal of strain with all her relationships. If she can’t get to the bottom of all the messes and dilemmas, Maddie just lose everything. Its Wine and Chocolate Days in San Benedetto, and paranormal museum owner Maddie Kosloski has sweet dreams about her new Magic of Chocolate exhibit. Her latest attraction is a haunted Mexican whisk called a molinillo that rattles if someone lies. When Maddie visits the town's new boutique chocolate shop, she finds one of the owner’s dead covered in melted cocoa. Maddie's determined to catch the killer. She soon uncovers deadly dealings in the world of artisan chocolate. The deception surrounding Its Wine and Chocolate Days in San Benedetto, and paranormal museum owner Maddie Kosloski has sweet dreams about her new Magic of Chocolate exhibit. Her latest attraction is a haunted Mexican whisk called a molinillo that rattles if someone lies. When Maddie visits the town's new boutique chocolate shop, she finds one of the owner’s dead covered in melted cocoa. Maddie's determined to catch the killer. She soon uncovers deadly dealings in the world of artisan chocolate. The deception surrounding those dealings are enough to make the molinillo rattle all night. Will Maddie have to temper her passion for sleuthing before a killer makes her fate bittersweet? Maddie isn’t your average shopkeeper. In Chocolate a la Murder running a paranormal museum is not for the faint of heart. Keeping customers coming through the doors is vital. So, when Wine and Chocolate days start in San Benedetto, Maddie jumps into the fray to give her customers something special. Then she finds a body covered in chocolate and everything changes. Maddie is struggling to keep her business open and her bills paid. Things have gotten better at the museum, but she is always looking for ways to improve business and her income. As much as she likes to pretend that she doesn’t believe in ghosts, haunting's and so forth, she finds herself needing to make everyone else believe. Bringing in a haunted molinillo that makes noise every time someone tells a lie is a great start, and before long she begins to believe it really is haunted. Characters in this series are always amusing. They bring reality to an otherwise fantastical story. Friends Adele and Harper are busy with their own lives, one is obsessed with her wedding and the other is too busy most of the time to be of any help. When things suddenly get topsy-turvy in Maddie’s life they are of little help. Even her wonderful boyfriend, Jason is of little use in solving this crime as he isn’t on the case because of her involvement. Finding a killer before they strike again becomes her number one priority, even over chocolate. The murderer thinks she has evidence or knows who they are and has decided that Maddie is the next target. Eventually the killer is unmasked, and justice is served after Maddie realizes who the killer is. However, the motive leaves her baffled and is fitting in today’s world. Wine and chocolate are great together but not so pleasant when murder is added. Poor Maddie finds out the hard way - will she ever enjoy chocolate again? Here she is, in the 4th entry to this satisfying, quirky series and life is complicated as she tries to pull things together to participate in the San Bendetto, California Wine and Chocolate days festivities. Her newest addition to her Perfectly Proper Paranormal Museum fits in well - it's a haunted Mexican chocolate whisk, known as a molinillo Wine and chocolate are great together but not so pleasant when murder is added. Poor Maddie finds out the hard way - will she ever enjoy chocolate again? Here she is, in the 4th entry to this satisfying, quirky series and life is complicated as she tries to pull things together to participate in the San Bendetto, California Wine and Chocolate days festivities. Her newest addition to her Perfectly Proper Paranormal Museum fits in well - it's a haunted Mexican chocolate whisk, known as a molinillo, it rattles when someone lies and has pride of place in her Magic of Chocolate exhibit. Down to the wire, the festivities almost upon her and the delivery of fine, hand crafted local chocolates have not arrived as promised. While Maddie might be able to deal with the glitch, her friend, Adele - who has the tea room next door and is also waiting for her shipment of the aforementioned chocolate - not a chance. Three months until her wedding and she is fast becoming a bridezilla. Maddie should have stayed away but she decides to go get the chocolate but finds one of the chocolatiers stone cold dead, covered in melted chocolate. She may never, ever enjoy chocolate again. I sure wouldn't want it anymore. Life is sure complicated for Maddie way beyond her comfort zone. Running her museum with its paranormal slant is one thing and growing her romance with her cop boyfriend, Jason - all good. Add her mother, still fine. But then one of the investigating officers is Maddie's high school nemesis - the girl who bullied her and made her life miserable - now that's too much. The police want her to stay out of the investigation but Maddie ends up doing her own investigating but, in the process, will the killer come after her, as well? This entry can be read out of order but be prepared to add the other three books to your TBR list. Maddie, her Mom, her friend, Adele, Jason and, last, but not least her cat, GD ( a cat with a major attitude, especially towards certain cops) are all well worth spending more time with. I'm ready for book #5. I’m pretty picky when it comes to cozy mysteries. Some cozy heroines are a bit too gee-golly-gosh for me, to the point where they seem like caricatures. But give me a protagonist who’s feisty and clever, and I’m hooked! Happily, that was the case with Maddie Kosloski in Chocolate a la Murder by Kirsten Weiss. Maddie owns a paranormal museum in the heart of California wine country. With the town’s Wine and Chocolate Days celebration drawing near, Maddie is incorporating local chocolatier Reign int I’m pretty picky when it comes to cozy mysteries. Some cozy heroines are a bit too gee-golly-gosh for me, to the point where they seem like caricatures. But give me a protagonist who’s feisty and clever, and I’m hooked! Happily, that was the case with Maddie Kosloski in Chocolate a la Murder by Kirsten Weiss. Maddie owns a paranormal museum in the heart of California wine country. With the town’s Wine and Chocolate Days celebration drawing near, Maddie is incorporating local chocolatier Reign into her store’s Magic of Chocolate display. She’s also acquired a special artifact: a haunted Mexican whisk that supposedly rattles whenever someone lies. When Maddie visits the chocolate shop, she finds it empty—except one of the co-owners is in the back room, dead and covered in melted chocolate. This isn’t Maddie’s first rodeo when it comes to running across dead bodies, so she quickly puts on her amateur sleuth hat to get to the bottom of the murder. I’m a new Kirsten Weiss fan! Chocolate a la Murder is chock-full of twists that advance the mystery plot, while also including a dash of romance for good measure. Although this is book #4 in the Perfectly Proper Paranormal Museum Mystery series, I easily read it as a standalone. I plan on going back to book #1 and starting the series properly since I enjoyed this so much. Be advised, the story will make you crave chocolate of all kinds while reading it! You’ve been warned! Highly recommended for cozy fans who enjoy a sprinkle of paranormal and romance with their mystery. This is the 4th book in the "A Perfectly Proper Paranormal Museum Mystery Series". This series is the perfect cozy mystery with all the right elements of a proper sleuth, a fun Museum setting and great charcters. i have read the entire series and highly recommend the entire series. It has a bit of the paranormal which adds to the fun of reading this series. Each book can be read as a stand alone however I recommend the entire series. Its fun for the reader to experience The Paranormal Museum fro This is the 4th book in the "A Perfectly Proper Paranormal Museum Mystery Series". This series is the perfect cozy mystery with all the right elements of a proper sleuth, a fun Museum setting and great charcters. i have read the entire series and highly recommend the entire series. It has a bit of the paranormal which adds to the fun of reading this series. Each book can be read as a stand alone however I recommend the entire series. Its fun for the reader to experience The Paranormal Museum from the beginning. The Museum features new interesting paranormal items in each book . In this next in series our intrepid protagonist Maddie who owns the Perfectly Proper Paranormal Museum in San Benedetto is busy getting ready for The Wine and Chocolate Days Festival in San Benedetto. . When she goes to the local chocolate shop to pick up a order that has not arrived, she finds the owner face down and murdered covered in chocolate. its quite a shock for her as he was well liked and everyone loved his shop. As the police arrive Maddie is determined to find out what happened and bring the murderer to justice. She is once again on the case and soon finds many clues with help from the local shop keepers and friends of hers.. The Wine and Chocolate Festival will bring new clues and suspicions to help her solve the case. I enjoy this series for its well crafted sleuth, the fun descriptions of the museum and the well rounded charcters that all add to the story. This addition had some wonderful quirky chocolate facts included. Its always a fun cozy read and I look forward to the next in series. Thank you for the ARC which does not influence my review. This is the first book in the series that I have read, but I did not find it difficult to get caught up with the characters or town. The author makes references to the events from previous books which was helpful - the references were general which was also good since I want to go back and read the previous books and I don't feel like they've been spoiled for me. I really enjoyed the characters in this book, especially the friendship between Maddie, Adele, and Harper. Adele's ability to continue to focus solely on the details of her wedding was kind of amusing with everything else going on, but she never comes across as selfish or self-absorbed. I also appreciated that Maddie and Jason talked about things rather then letting them fester - it's always refreshing to see adults acting like adults. In a lot of ways this book reminded me of the 'Murder She Bakes' mysteries, but it was in no way a rip off or poor copy. The characters and plot were 100% original, they just had the same feeling to them. So, if you like those books/movies you'll also enjoy this one. Maddie Kosloski who owns the Perfectly Proper Paranormal Museum in San Benedetto. The museum is a local town tourist attraction that exhibits artifacts that have a paranormal or haunted history attached to them. Maddie’s latest artifact is a haunted Mexican whisk called a molinillo that rattles if someone significantly lies. As Maddie gets involved in Wine and Chocolate Days, she finds that she is missing a key component to make her Magic of Chocolate exhibit a success, the chocolate. Maddie deci Maddie Kosloski who owns the Perfectly Proper Paranormal Museum in San Benedetto. The museum is a local town tourist attraction that exhibits artifacts that have a paranormal or haunted history attached to them. Maddie’s latest artifact is a haunted Mexican whisk called a molinillo that rattles if someone significantly lies. As Maddie gets involved in Wine and Chocolate Days, she finds that she is missing a key component to make her Magic of Chocolate exhibit a success, the chocolate. Maddie decides to just head over to the local chocolate shop and pick up her overdue delivery herself. After crossing a picket line of one, she walks into a quiet business only to discover one of the owners is in the back covered in chocolate. So, did he die by accident, natural causes or was it something else? I found that this can be read as a standalone book. I liked the humor, the plot, and the profession of Maddie Kosloski. She owns a paranormal museum which isn’t a common profession. I did peg the killer early on but there were plot twists. I would read more in this series. This was a fun and entertaining read. Thank-you to Netgalley & Midnight Ink for allowing me to read this book. These are my unsolicited opinions. If you like Kirsten Weiss has never met a dessert she didn’t like, and her guilty pleasures are watching Ghost Whisperer re-runs and drinking red wine. The latter gives her heartburn, but she drinks it anyway.